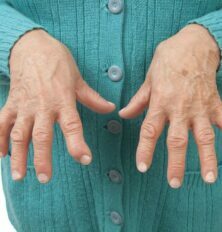 The first sign of rheumatoid arthritis is generally going to be pain and inflammation in the smaller joints such as those in the fingers and toes. As the disease progresses, pain and inflammation spread to larger joints, including wrists, ankles, knees, shoulders, etc. Further progression of the disease involves erosion of the tissues at the joints, and this can lead to short-term or long-term deformity or loss of mobility. This deformity is more likely to present in hands and feet and can cause a deviation of the finger mimicking a swan neck in shape. In its more advanced state, rheumatoid arthritis often causes a condition known as rheumatoid nodules. These are cyst-like lumps of tissue that typically accumulate around pressure points like elbows. However, they can occur in any part of the body and have been known to compromise the patient’s lungs. Rheumatoid arthritis can lead to a number of other health issues including dry mouth and dry eyes, increased body fat in people who are not overeating, and carpal tunnel syndrome. The most serious complications of RA are hardening and blocking of arteries leading to and from the heart, leading to heart disease; scarring and inflammation of lungs; lymphoma; and liver damage. 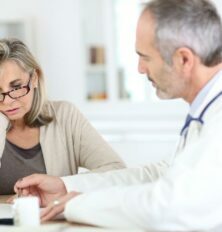 Patients diagnosed with rheumatoid arthritis must be aware that the drugs used to treat the disorder can also lead to serious health complications. Osteoporosis, for instance, can occur as a natural result of the disease or as a side effect of medications. People with RA are also at a substantially higher risk of getting infections, either as a consequence of the disease or the medications used in treating it which may lower the body’s immune functions. There is no one test that can be used to definitively diagnose rheumatoid arthritis. Physicians must rely on a combination of blood work, family history, imaging (such as MRIs and ultrasounds), patient testimony about symptoms, and elimination of other possible diseases that have similar symptoms. Patients who are under suspicion of RA will undergo a number of tests in order to obtain an accurate diagnosis and effective treatment. The journey toward an RA diagnosis generally begins when the patient goes to a family doctor complaining of joint pain. The doctor’s first move is likely to be blood work. If the patient’s blood work comes back positive for the ACPA or rheumatoid factor antibodies, the next step is likely to be imaging. Some studies suggest that a Doppler ultrasound is the most efficient test for discerning RA, but your doctor may want an MRI or CAT scan as an alternative to or in addition to an ultrasound. These imaging studies give the patient and her physician a clearer idea of the extent to which the disease has progressed if it is present. Specifically, the images will show to what extent joint tissue has been damaged, whether joints are in the process of being deformed, and whether or not rheumatoid nodules have formed somewhere that they are not immediately noticeable. At some point, a physician who suspects rheumatoid arthritis will need to make sure that the symptoms are not caused by one of the many diseases that may look like RA. Rheumatoid arthritis has many symptoms in common with systemic lupus erythematosus, Lyme disease, Hepatitis C, and several other illnesses, so it is important to rule out those conditions on the path toward an accurate diagnosis.